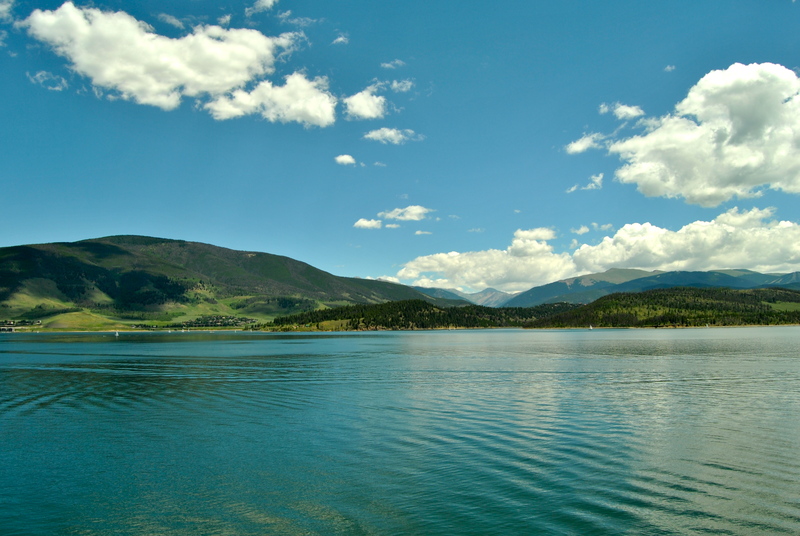 Looking out over the Dillon Reservoir in Colorado. Denver Water, the utility that owns the Dillon Reservoir and delivers fresh water to 1.3 million people in Denver and its suburbs, hadn’t worried about the forests surrounding their water supply much until 1996, when the Buffalo Creek fire tore through 11,700 acres near their Strontia Spring reservoir. After the landscape was charred, rains rolled in and water flow jumped from 1.5 cubic feet per second (cfs) to 1,000 cfs in no time. No longer slowed and absorbed by trees, the water washed debris and sediment off the landscape into the reservoir, degrading the water quality. “The Buffalo Creek Fire was when we got in the watershed business,” said Don Kennedy, an Environmental Scientist at Denver Water. “It costs a lot to build reservoirs, so we wanted to protect them. 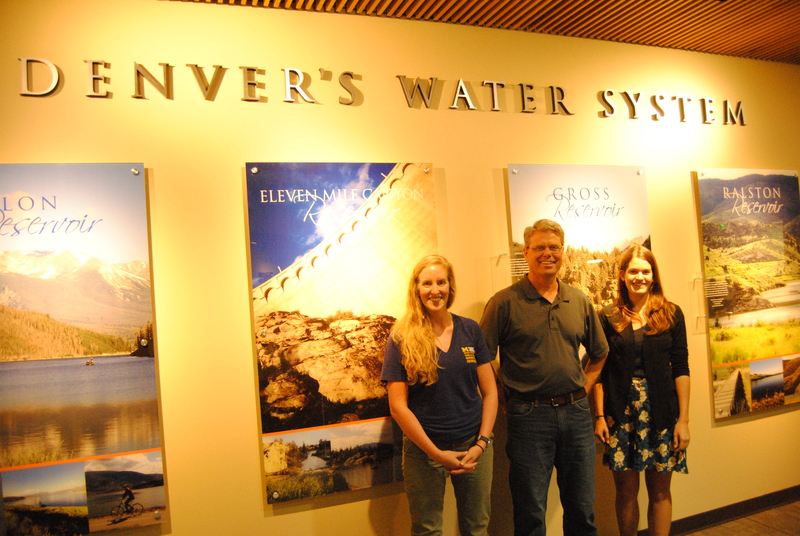 Kirsten Howard (left) and Allie Goldstein (right) stand with Don Kennedy at Denver Water’s headquarters. Some of that protection came through the 2010 From Forests to Faucets partnership with the U.S. Forest Service, a unique payment for ecosystem services mechanism that connects downstream water users to the upstream forests that protect their water supplies. Denver Water gave the Forest Service $16.5 million—which the agency matched to total $33 million—in exchange for fire management on 38,000 acres of National Forest lands. The money is being dispersed over five years to treat forestland near important Denver water sources. The deal benefits both partners, providing the funds the Forest Service needs to do work it wants to do, and reducing the risk to Denver Water’s water. On track to complete the commitment by 2015, so far 16,800 acres have been treated with thinning and pile burning, with 7,500 more currently in progress. Low-intensity fire has been an integral part of Colorado’s forest ecology for thousands of years before people began moving to the area and actively keeping it out. But last year’s fire season was one of the worst on Colorado’s record, and after the Black Forest fire, 2013 is not looking much better. Ekarius said that Colorado’s forests have 3-20 times the trees that existed before European arrival. 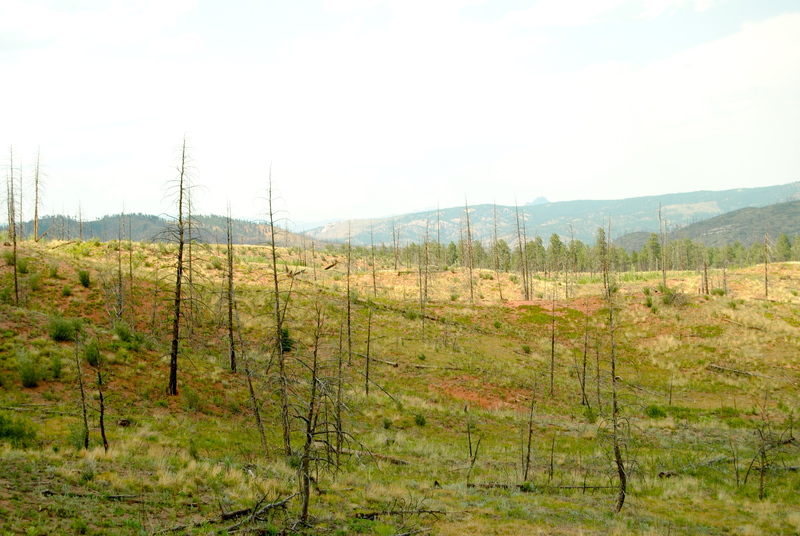 This forest is managed to contain fewer trees per acre, making it more resilient to fire. The result was an unkempt house. 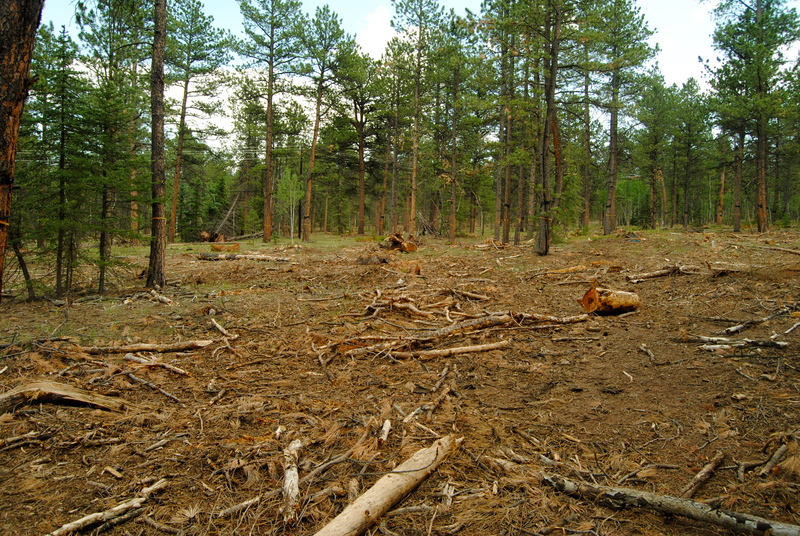 Without groundfires to clean up the mess, brush built up on the forest floors of the Rockies and Front Range. Trees grew closer together until they resembled tinderboxes ready to burn down at the slightest spark. Add climate change to the equation, which has reduced the annual snowpack that dampens the forest floors during spring melts, increased drought intensity, and expanded the destructive pine beetle range to new latitudes (turning trees into dead ‘matchsticks’), and these forests are burning hotter, faster, and for more of the year than ever before. Crown fires that shoot up into the tops of trees, killing them, have now replaced the housekeeping groundfires. These fires, Ekarius explains, are the biggest threat to Colorado’s clean drinking water. Mitigating them requires reducing the fuel load in the forests. 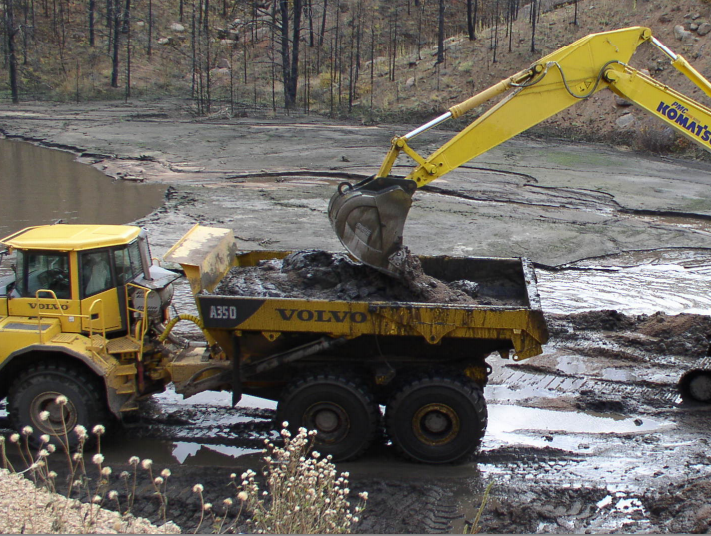 After the Buffalo Creek fire in 1996, Denver Water spent months and $3 million to muck out the 15 acres of debris in and around Strontia Springs. Water treatment intensified as the dissolved oxygen, organic matter, cadmium, manganese, and phosphorus content in the smoky water coming into the plant skyrocketed. To minimize the chance of a similar catastrophe occurring after the next fire, the utility built two sediment traps near Turkey Creek (price tag $850,000) as well as a berm. 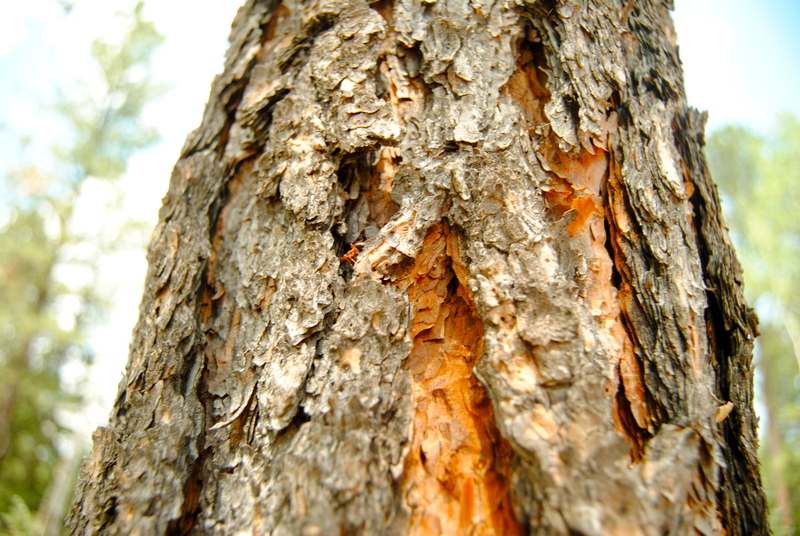 The Hayman fire burned many acres of Colorado’s ponderosa pine in 2002. It looks like this today. In addition to these structures, they also started experimenting with forest management on their 50,000 acres, creating a fuel break—a deforested break in the trees—near Cheesman Canyon where the South Platte River, which carries 50 percent of Denver’s water, flows. In some places, the company clear-cut to remove most of the potential debris. These preventative measured were done just in time for the Hayman fire in 2002, which, at 137,000 acres, dwarfed the Buffalo Creek fire. The fire and flood mitigation helped minimize restoration costs, but Chips Barry, the then-President of Denver Water, decided it wasn’t enough and turned the utility’s focus on the land it didn’t own. “Denver Water didn’t want to wait for the Forest Service to eventually get to the areas it cares about. The partnership is accelerating work we want to do,” said Claire Harper, a Partnership Coordinator for the Forest Service. So From Forests to Faucets was born. 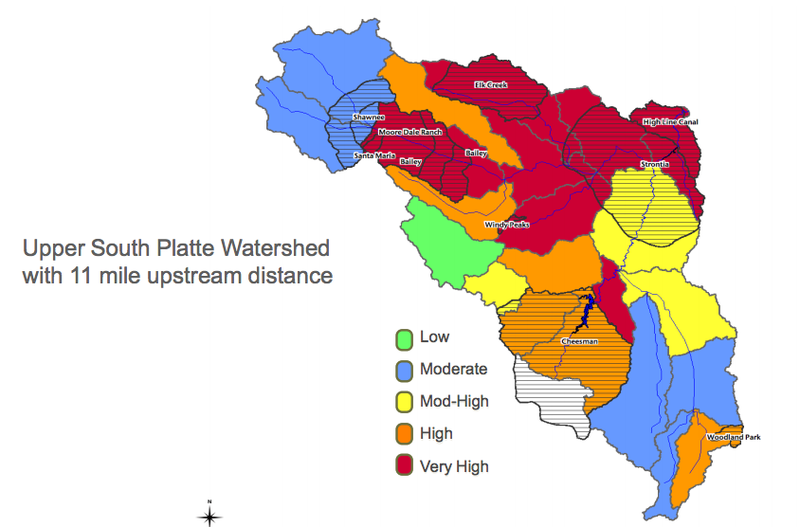 The first thing Denver Water did was figure out which areas, if managed for fire, would protect their water sources the most. JW Associates, a consulting firm, was hired to conduct a prioritization study for Denver Water’s ‘service-shed’ that factored in things like fire risk and soil erosion risk to create a Composite Hazard Ranking that helped determine zones of concern. From this analysis, Kennedy and his team determined that the Forests to Faucets Partnership funds should be focused first on Forest Service lands around the Cheesman Dam and the Strontia Springs reservoir. “We can’t treat every acre so we need to prioritize,” Kennedy said. To finance the partnership, Denver Water increased water utility rates by $0.14 per month for every household—totalling approximately $27 over five years. Kennedy, who lives with his wife, two daughters, and two dogs pays about $135 per month for water in the summertime—so an extra 14 cents wasn’t that noticeable. 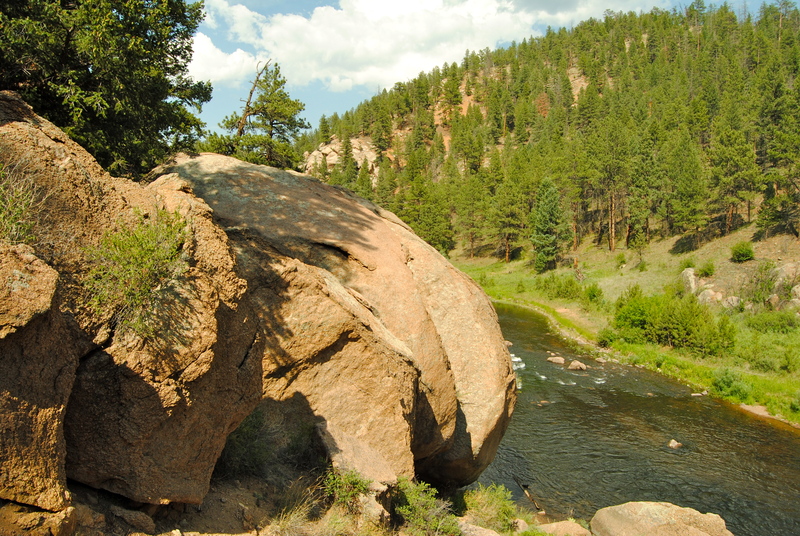 The South Platte River carries water through the Cheesman Canyon. The Forest Service contracts out much of their forest management work to companies across the Front Range and Western Slope. Multiple methods exist for turning the forests from fire-hungry to fire-adapted, most of which include thinning the forests and burning piles of fuel, and in some cases burning controlled fires across the forest floor—though this has been too risky in recent drought years. CUSP, which receives Forests to Faucets funding, is working with contractors and scientists to improve existing approaches. “For fire adaptation, we need to get out of the concept where you apply solutions equally across the landscape because you’re dealing with different ecosystems,” Ekarius said. 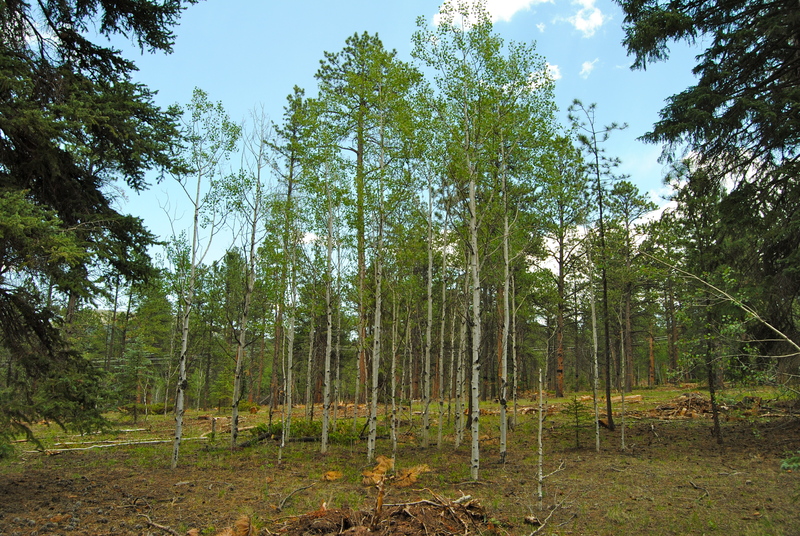 The Woodland Park Healthy Forest Initiative preserves stands of aspen along with the pines. She explained that many forest management projects still look like tree farms—all trees of the same species and age. Through the Woodland Park Healthy Forest Initiative, a collaborative and experimental project, CUSP and the partners are mimicking a natural forest ecosystem, leaving larger patches between tree stands as well as a mix of ages and species. This kind of treatment leaves forests more resilient to fires and other stressors. The Forest Service, one of the project partners, could eventually apply this patchwork approach on its Forests to Faucets projects. Finding people with skills and equipment to treat the forests is challenging since the timber industry is nearly extinct. Groups like CUSP, area water providers, county offices, and the Forest Service have been slowly building a base of contractors. Given that 1.8 million acres of forest need treatment in the Front Range alone, Ekarius sees this as an economic development opportunity combined with risk management. 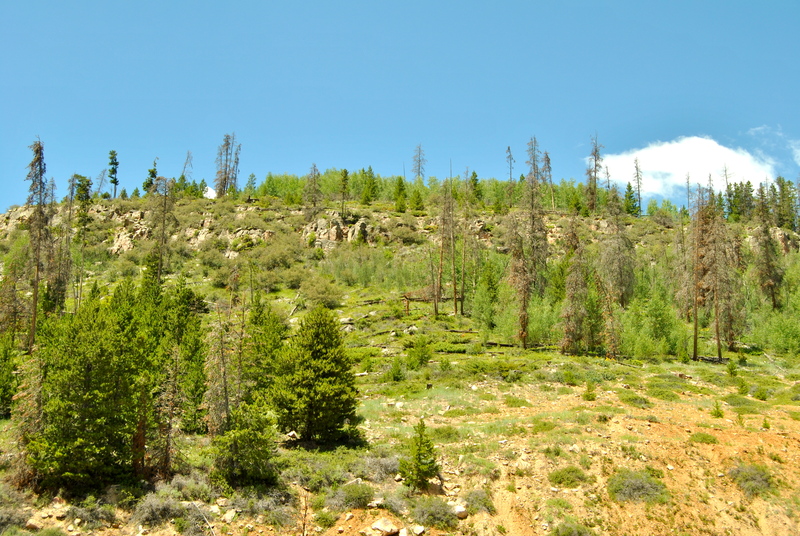 Some forest management near the Dillon Reservoir. Overall, Harper from the Forest Service is pleased with the Forests to Faucets partnership and has worked with other municipalities in the area, like Aurora, to form similar agreements. Now, Harper is helping to develop a partnership with Xcel, the major electric utility for the region, which has a vested interest in reducing fire risk to its power lines and other infrastructure. As for the future of From Forests to Faucets, Kennedy plans to encourage Denver Water’s Board to continue some form of the partnership after 2015. 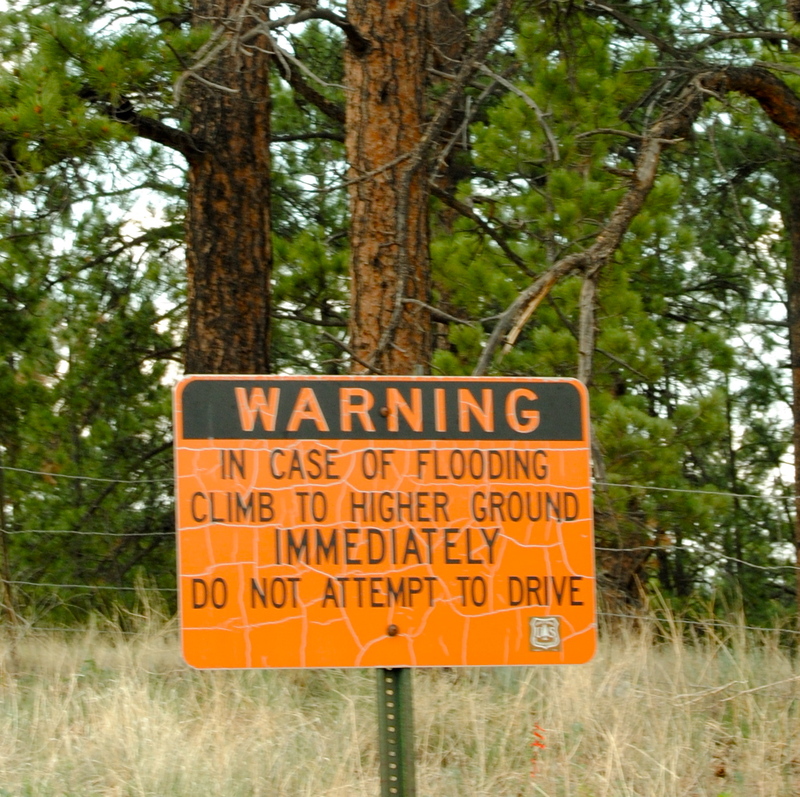 Signs warn of flood risk near the Hayman burn scar. 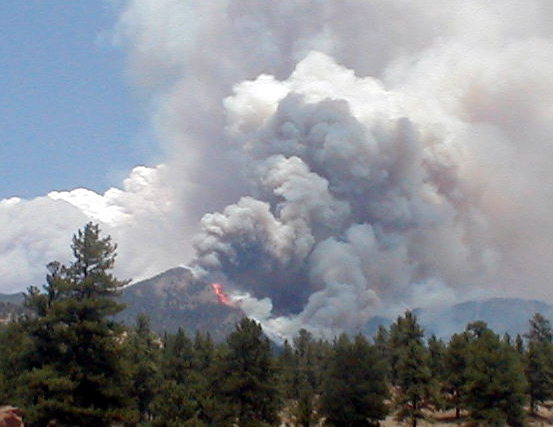 With these kinds of private-public payment for ecosystem services partnerships, forest management may help to protect specific water sources and important resources, but after a century of fire suppression and with climate change significantly raising fire risk, there is a kind of acquiescence to the idea that Coloradoans will have to prepare for more fire in the future—a new normal. See more photos of our search for fire-adapted forests in Colorado here. Reblogged this on Mile High Water Talk. This is a very good example of how all countries should cooperate in order to prevent environmental issues. However, in different parts of the world situations are different and issues such as poverty and lack of education can make the adaptation to a cleaner environment almost impossible. 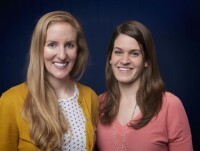 Great read and very informative article. Thank you for sharing it.